AUGUSTA, Ga. -- The final round of the 2019 Masters is here. With an early start and Sunday, there are just handfuls of holes left to play before Round 4 concludes in the early afternoon to avoid rain and thunderstorms Augusta National. Golfers started the day split at Nos. 1 and 10 and are looking to find rhythm as they pursue a green jacket and massive first-place prize. The final group -- Francesco Molinari, Tiger Woods and Tony Finau -- is on the course and remains the one to watch down the stretch. The best news about the remainder of the Masters is that we will surely have a fantastic finish. A close second is that you will be able to watch the biggest shots and best moments live on CBS, CBSSports.com and the CBS Sports app. CBS Sports offers live coverage from start to finish on Sunday with our myriad of Masters Live streaming options. Hit the links below to tune into the Featured Groups channel and watch Tiger, spend your day surveying Amen Corner or tuning into Holes 15 & 16. 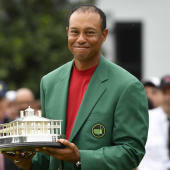 Amen Corner -- 7:40 a.m. to 1 p.m.
Holes 15 & 16 -- 8:40 a.m. to 1:30 p.m.
CBS Sports HQ, the 24/7 streaming sports news network from CBS Sports, will feature live updates and reports on the leaderboard and latest stories from the Tournament beginning Monday with Doug Bell and CBS Sports golf writer Kyle Porter. Highlights also will be available on CBS Sports' social channels, and CBS Sports' broadcast coverage will be available to stream live via the CBS All Access subscription service.